The EU gave traders new reason to fret that markets could turn ugly. EU-based money managers would be required to trade more than 6,200 shares inside the bloc -- they would be blocked from using exchanges in London. 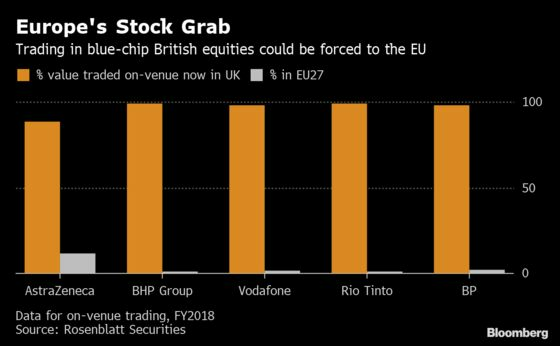 That restriction, unveiled just this week, would extend even to blue-chip shares that have their primary listing in the U.K., such as AstraZeneca Plc, Rio Tinto Plc and Vodafone Group Plc. Industry lobbyists are pleading with EU policy makers to reconsider and for the U.K. not to retaliate; investors will pay more and traders will almost definitely face difficulty executing transactions, they say. About 20 trillion pounds ($26 trillion) of swap contracts between U.K. and EU traders mature after the end of this month. While the contracts will remain valid, lawyers and derivatives traders are still scrambling to work out how they’ll be serviced. The problem is that some so-called life cycle events in the contracts -- such as extending the maturity of a trade -- could require an EU license. National authorities in the remaining 27 member states have enacted legislation that helps solve the problem, but the measures are all a little different, which has complicated matters. Banks have also been undergoing a cumbersome process of switching contracts to new EU entities from their U.K. ones -- a shift known as “re-papering.” Firms are about 10 percent of the way through the process if they’re going contract by contract with clients, according to EY’s John Liver. U.K. property funds for mom-and-pop investors were among the most visible casualties in the immediate aftermath of the June 2016 Brexit vote. That’s because the funds own buildings that can take months to sell, while offering investors the chance to pull their money out at a moment’s notice. That mismatch was exposed after the referendum, when panicked investors pulled hundreds of millions from the funds, forcing several managers to halt payouts until they could sell properties. A fresh wave of Brexit jitters provoked another slew of redemptions in December that depleted their cash buffers. While several managers are now in the process of selling properties to build up war chests, the stage is set for that mismatch to be exposed again in a chaotic Brexit. European regulators have warned that smaller financial firms, especially payment and e-money institutions, aren’t as well prepared for Brexit as they should be. A large volume of business in the European payments industry is handled by platforms based in the U.K. Those firms will lose the ability to automatically do business in the EU after Brexit; EU authorities are telling the companies to hurry up with their contingency plans. Liquidity is the lifeblood of the financial system, so the Bank of England is holding daily calls with lenders to monitor the situation and assess credit quality, according to Barclays Plc Finance Director Tushar Morzaria. 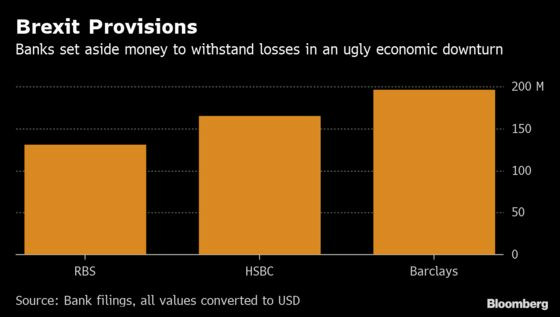 U.K. banks have more than one trillion pounds of liquid assets and are able to meet maturing obligations for many months, the BOE says. The central bank has activated an extra system as a precaution to make sure the country’s banks can access euro funding in an emergency. Meanwhile, Barclays set aside 150 million pounds to withstand potential deterioration in the British economy, while HSBC Holdings Plc booked $165 million and RBS announced a 100-million-pound provision in October. Lloyds Banking Group Plc -- the lender most exposed to Brexit through its U.K. consumer loan book – refrained from setting aside a specific provision, and is planning for a more orderly withdrawal. Those provisions may be needed if -- among other dangers -- a plunge in the pound damages small, unhedged businesses that depend on importing goods.